Ingres was a French Neoclassical painter. Although he considered himself to be a painter of history in the tradition of Nicolas Poussin and Jacques-Louis David, by the end of his life it was Ingres's portraits, both painted and drawn, that were recognized as his greatest legacy. A man profoundly respectful of the past, he assumed the role of a guardian of academic orthodoxy against the ascendant Romantic style represented by his nemesis, Eugène Delacroix. 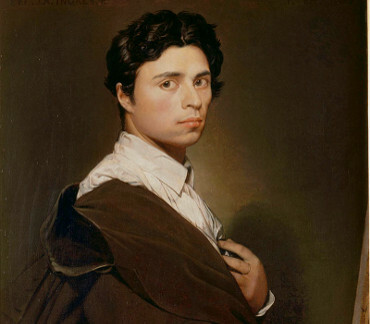 Nevertheless, modern opinion has tended to regard Ingres and the other Neoclassicists of his era as embodying the Romantic spirit of his time, while his expressive distortions of form and space make him an important precursor of modern art. French Neoclassical painter (1780-1867). 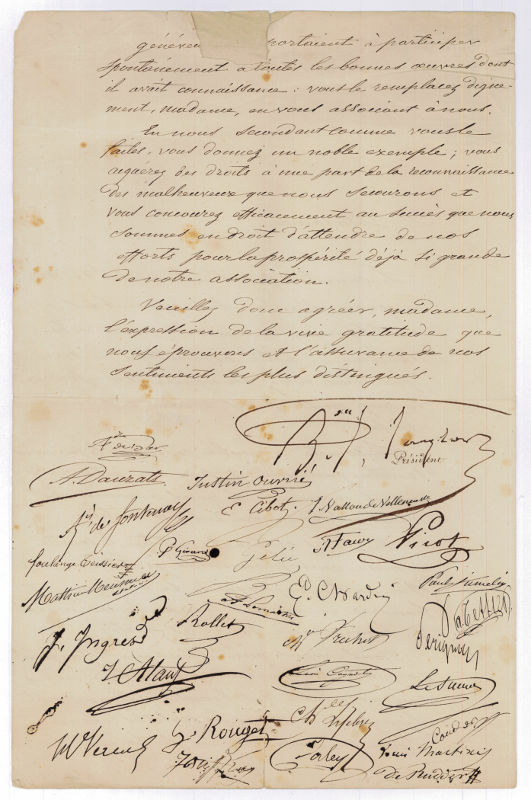 Letter with 32 signatures from members of the Association des Artistes peintres, sculpteurs, architectes, graveurs et dessinateurs. [Paris]. Folio. 2 pp. Bifolium with engraved letterhead. 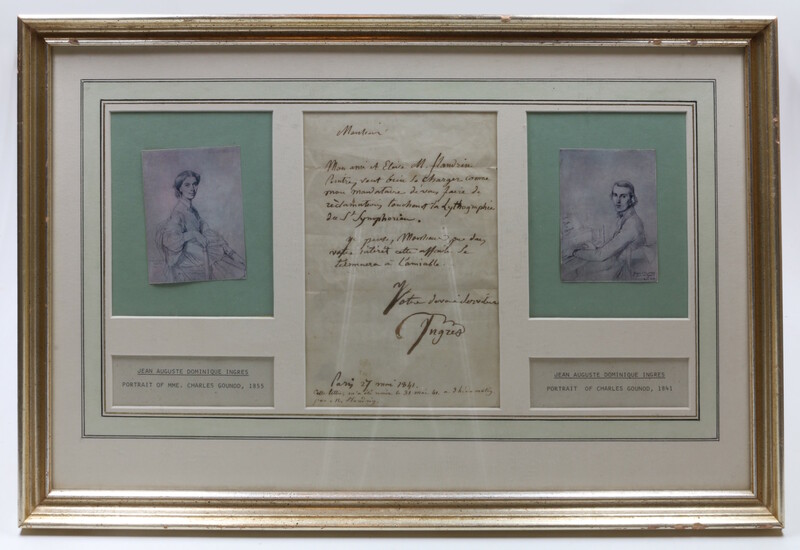 As a committee member of the group of artists to Madame Bonjean, who is appointed an honorary member for her generous donation to the Association. The Association des Artistes (called the Fondation Taylor) was created in 1844 by Isidore Justin Séverin Taylor and is today one of the most important institutes supporting artists and their work. 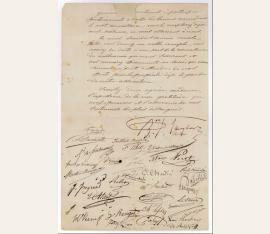 Beside Taylor and Ingres, the present letter bears the signatures of e. g. Alexandre des Bar, Edouard Cibot, Léon Cogniet, Alexandre Couder, Alexis Daligé de Fontenay, Adrien Dauzats, Antoine-François Gelée, Jean-Louis Nicolaus Jaley, Charles Victor Eugène Lefebvre, Augustin François Lemaître, Jean-Baptiste Cicéron Lesueur, Mathieu Roland Meusnier, Pierre Justin Ouvrie, Alexis-Joseph Pérignon, François-Édouard Picot, Louis René Lucien Rollet, Georges Rouget, Louis-Henri de Rudder, Louis Soulange-Teissier, Julien Vallou de Villeneuve, and Horace Vernet. - Rather strong damage to edges and spotty. 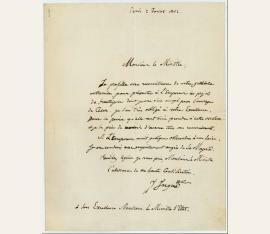 An extraordinary document of the famous Association des Artistes..
French Neoclassical painter (1780-1867). 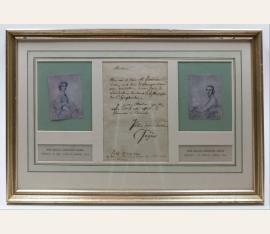 Autograph letter signed ("JIngres"). Paris. 4to. 1 page on bifolium. 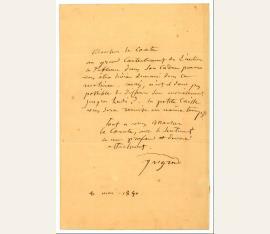 To Alexandre Colonna-Walewski, Minister of State under Napoleon III, thanking "pour présenter à L'Empereur les projets de frontispice". painter (1780-1867). Autograph letter signed. Paris. 8vo. Single leaf inscribed on one page. Matted and framed. To an unnamed recipient, regarding his friend and student, the painter Jean-Hippolyte Flandrin (1809-64) regarding a lithographic rendering of Ingres painting of the martyrdom of Saint Symphorien. 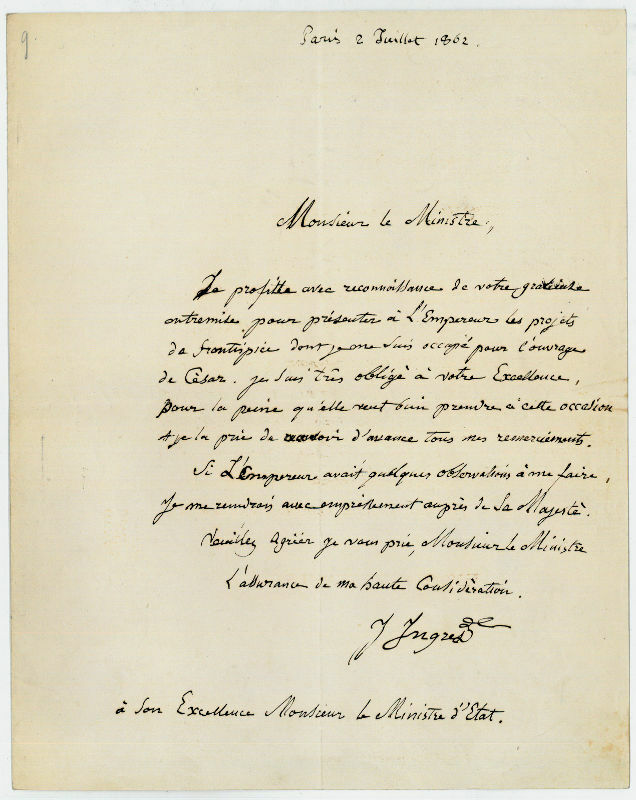 To his old friend and patron, Amédée David Comte de Pastoret (1791-1857) in Rome, concerning the delivery of a painting: "Monsieur le Comte / au grand contentement de l'auteur le tableau dans son cadre pourra vous être livré demain dans la matinée. Mais, n'est il donc pas possible de differer son encaissement jusqu'au Lundi. La petite caisse vous sera remise en même temps [...]". It is not clear which might be the work in question - probably that of another painter for whom Ingres was acting as an intermediary. All seven Ingres paintings known to have been owned by Pastoret (cf. Tinterow/Conisbee/Naef, Portraits by Ingres, p. 295) are of an earlier date. In 1840 Ingres completed two paintings begun in Rome: "Odalisque avec esclave" for Marcotte and "Antiochus et Stratonice" for the Duke of Orléans (cf. ibid., p. 551). - Includes two old collector's folders.